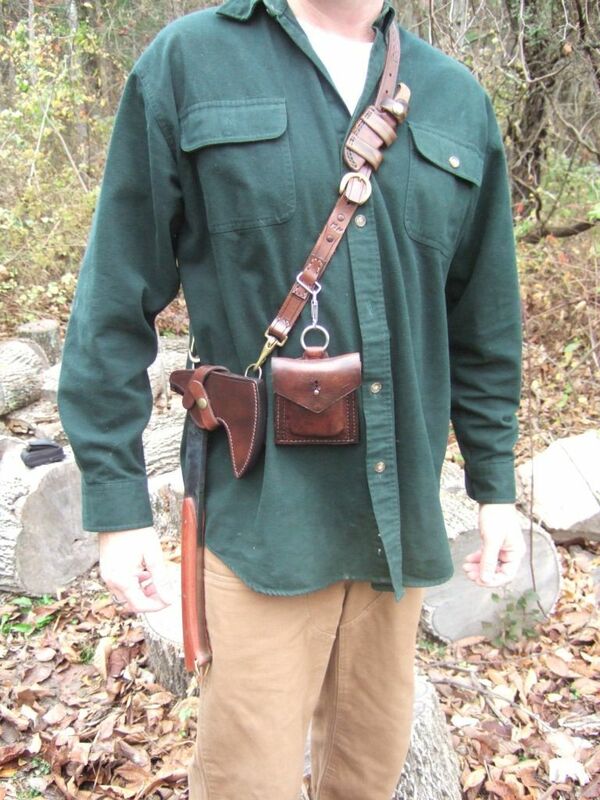 Lets see your Baldric rigs! 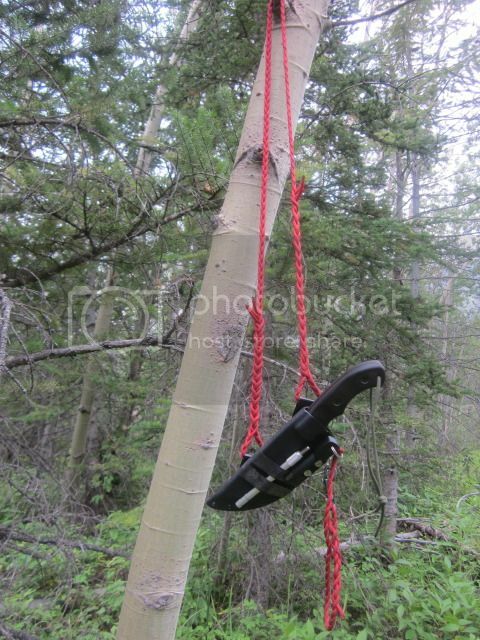 Discussion in 'Edged Tools' started by BigFootSurvival, Nov 19, 2012. Come on lets see `em. Mine own is....rudimentary Im looking for some inspiration. The one in the t shirt was made by my very good friend Jeff Marshall known here as Twinblade, the other was a convertd gun belt , both work well! Medicine maker, Barry J and Geezer like this. I have made a couple out of braided kangaroo. An 8-plait strap and a 12-plait. That's beautiful work Schwert. I've looked at that tutorial many times, but plaiting looked pretty intimidating to me. This would be a good carry method for winter so I may give it a try. Do you have a source on the kangaroo lace? Just curious, what machete is that? Medicine maker and Geezer like this. David Morgan is where I get my lace. His machine cut spools are perfect for such projects. If you are speaking of the one I am holding, its a Bark River Northwind, more of a sword than a machete, quite a bit heavier. I made this myself for my BK9 using some veg-tanned shoulder I bought from Tandy. It was a lot of fun to make and quite the learning experience. 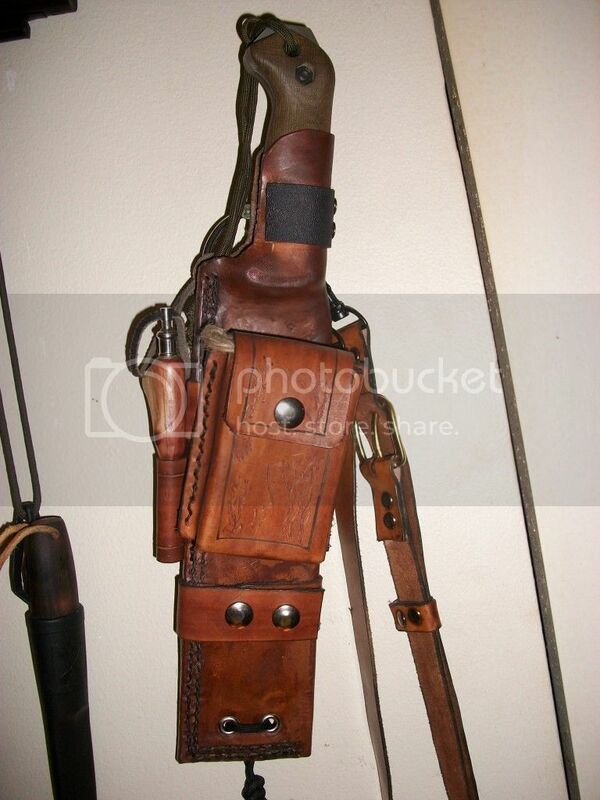 Notice the kydex retention on the handle, which I found while looking for inspiration on Google. Medicine maker, Barry J, Geezer and 1 other person like this. If you are speaking of the one I am holding, its a Bark River Northstar, more of a sword than a machete, quite a bit heayier. I'm sure it's just a typo, but I'm sure you mean 'Northwind". I may be wrong but didnt David Morgan design and make the famous indiana jones bull whip? Yes David Morgan braided all the whips for Indiana Jones and Catwoman. He is a wealth of knowledge on braiding. 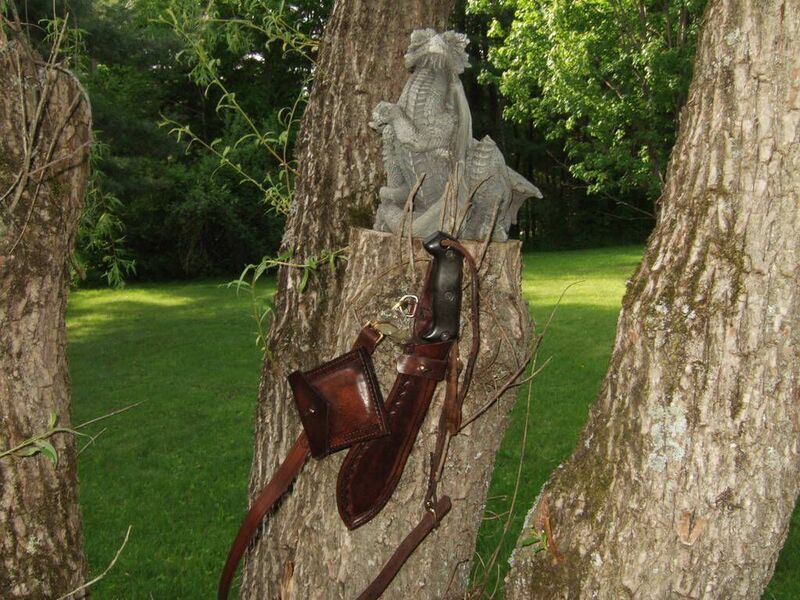 He braided this 10' Bullwhip for me several years ago. Yes you are right, HUA problem!! Does this count? 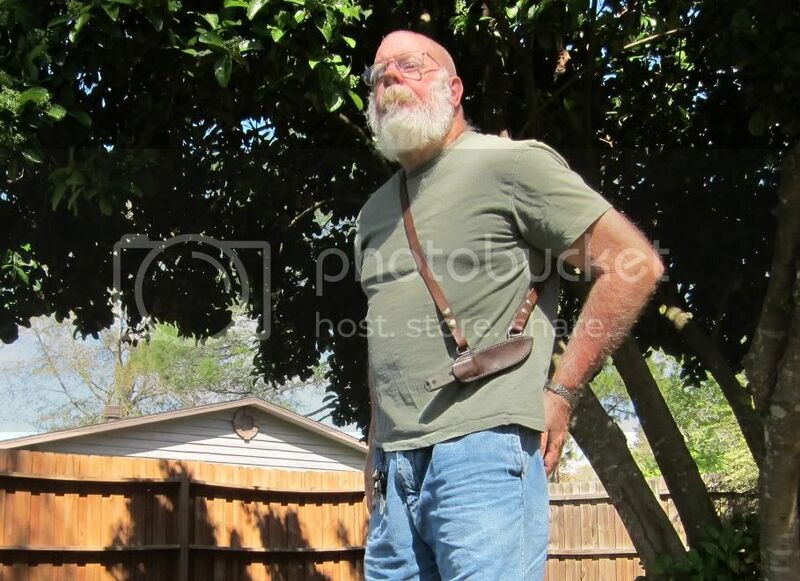 I am unfamiliar with Baldric rigs, but I gather that it is shoulder sling carry. Here is one I made out of paracord and fitted with D-rings to attach to my BK2 and or other stuff. I also included a loop at chest level for attaching other items. Medicine maker, Geezer and WILLIAM.M like this. That's a pretty sweet little setup. Looks perfect for woods bumming. Did you make it? Tapatalk ate my spelling and grammar. Bill , Glad to see you over here, you will recognize quite a few I am sure, I still go to the other place a lot but hang out here more cause of the interest in Axes. 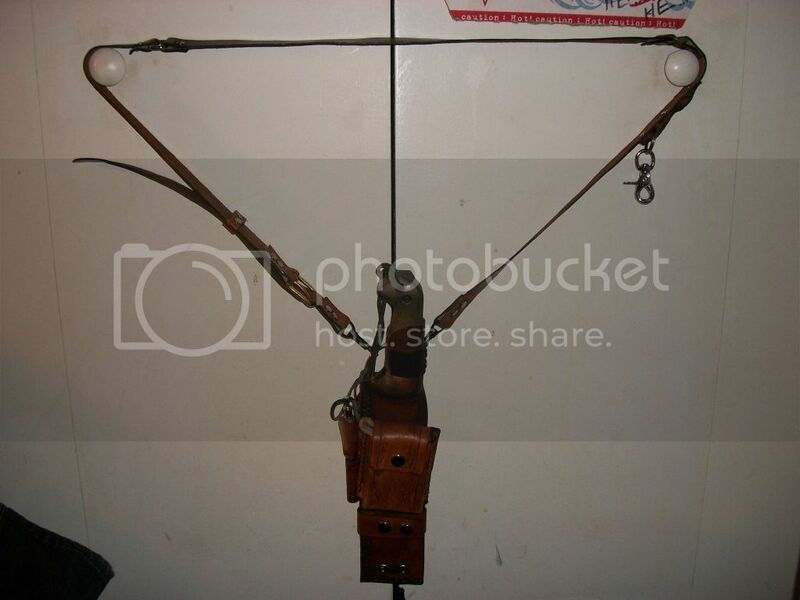 Would love to see Skabs version of a Baldric Rig. Hint hint. The Bark River Northwind was a one time affair as it was made up from some left over blades from another project and there are not a lot of them around, its a carbon steel knife that works very well for chopping and trail clearing vines and such as its long enough you dont have to bend over so much, I like it a lot and feel fortumnate to get one. The fellow who sold it to me was a really big time collector and friend and has since died of cancer, I liked him a lot and think about Charlie everytime I look at or handle the knife. 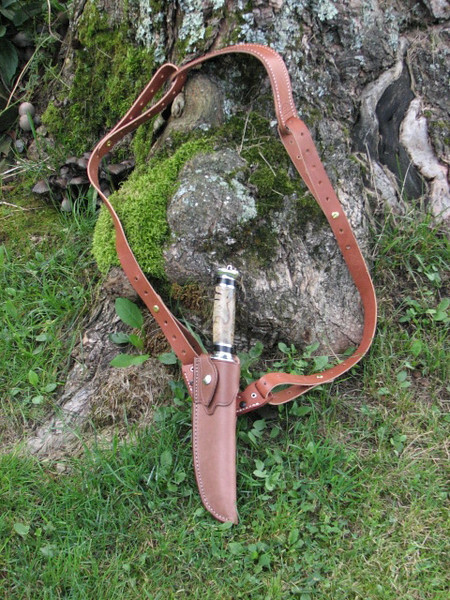 Here are some pics of it and the knife it was made up from, they definitly need a baldric to carry. I was looking at this thread and my wife, Tif, said "Who is that? ... he is adorable!" I said "That's Larry!" ..... she then said "awwww ... He's so cute!" Most of the ladies just say , He looks really old! Tell her thanks and clear some pms so I can pm ya! Question for Schwert - what type of jacket is that, and where did you get it? I've seen photos of John McCann wearing one like it. I'm curious abouit it. Thanks! Thanks for that. Now if I only had the patience. I have one of those, paid $200 for it on eBay but damn, those Filsons are worth every penny. Love those leather rigs. 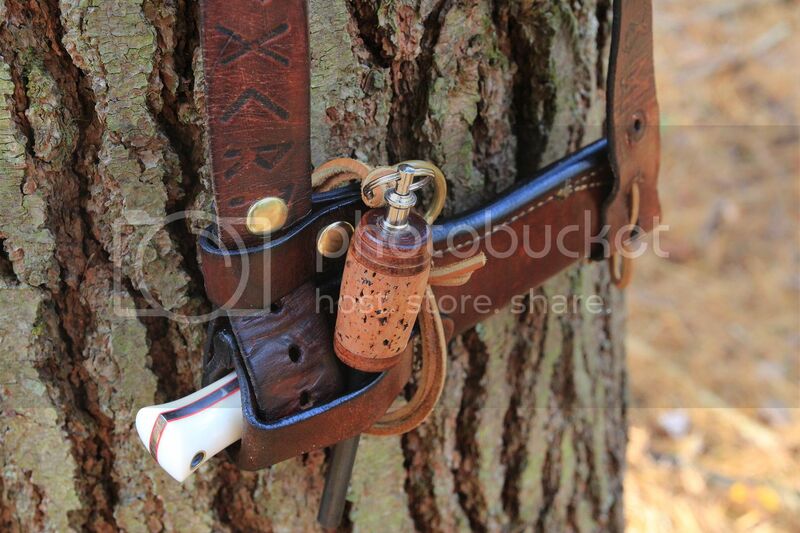 I need to come up with something like that for my Bark River Gunny.
! That rig is badass. Did you make it? What axe is that? And plz share where you got the rig. How much was the war hawk? This rig was made by Dwayne at ArmorAlleather. 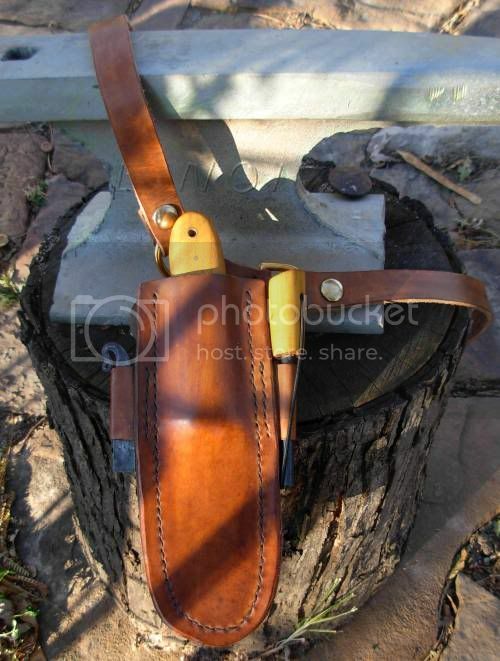 I can snap off the sheath, and put others on. 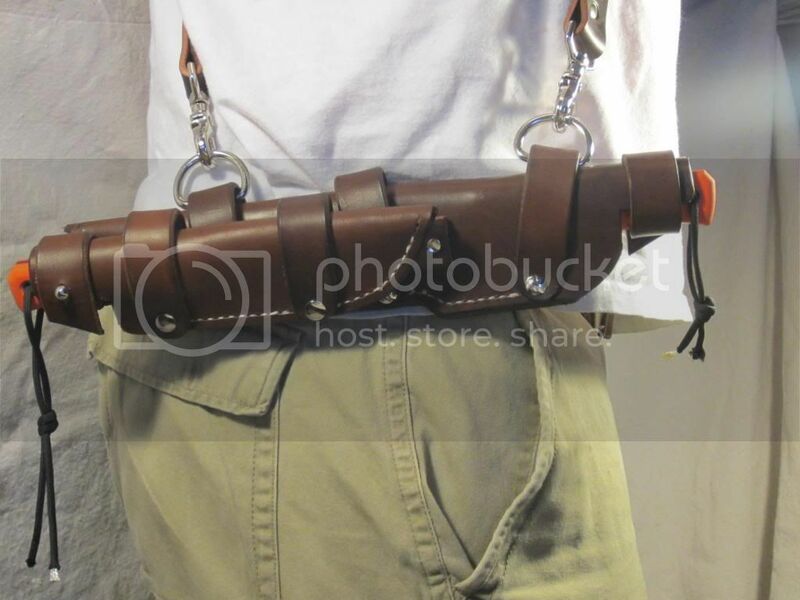 This way, just one strap accommodates several different knives. There are some REALLY amazing rigs on this thread!!! Here is one that I did. It lets me carry a large Bowie and a small EDC knife together in all of the combinations I could think of. Very nice setup! I may need to look into something like that for the cold months.